2016-02-26 I have implemented an RSS feed for updates to the archive. This includes both files which are entirely new, and files which have been updated. For those who wish to always be up to date on the state of the archives, but aren't necessarily in chat all the time to log updates from saxjax, this will hopefully be of use. We remind you that this feed is unlikely to update regularly, so it should be sufficient to query at most a handful of times per day. In addition to the program description, and time of most recent changes, we also provide URLs to the archive entry, the direct download link, and the author profile pages of the primary author and all co-authors. 2016-02-27 Improved "mobile web app" (i.e. "Add to Homescreen", basically just a bookmark, not an actual app) with jsTIfied on iOS. More improvements in the pipeline, as well as an improved experience for Android users. Similar improvements for Android users have been deployed with debugging help from Jonimus..
2016-03-08 The Cemetech server has been renewed for another year. Thanks to Alex "comicIDIOT" Glanville for making a contribution towards my out-of-pocket costs. 2016-05-24 cemetech.net has been renewed for another year. 2016-06-03 __MACOSX directories and .DS_Store, desktop.ini and thumbs.db files in archives submissions will now be automatically removed before entering the approval queue. 2016-06-04 Lest anyone be confused, staff member comicIDIOT's username is now Alex. 2016-07-16 Due to lack of activity from either project, the Grammer subforum for Zeda's idle project has been removed, as has the Super Smash Bros Open subforum for Hayleia's much-publicized, immediately-aborted project. In their places, we are featuring projects from two active members in two new Member Feature subfora: JamesV and PT_. Happening now, SAX may be down. This note will be removed when the process is complete. 2016-08-25 Updated the SAX backend to latest ejabberd and refreshed nickname registrations. 2016-11-29 Users can no longer accidentally highlight themselves in SAX by speaking on IRC. Previously, the fact that the user's name appeared in the message would cause an erroneous highlight. Now, IRC usernames are attached to messages sent over XMPP, so if the message would match the highlight (the first four characters of the user's name) but the IRC username of the sender also matches, the user is not highlighted. 2016-11-29 Thanks to Tari, messages longer than 384 characters will not be sent; instead, the message will be repeated in the user's local SAX along with an error that it was not sent. That will allow users to retain the unsent text if desired. 2017-02-18 I'm not sure if I was the only person it was bothering, but PMs now have a Quote button again in Firefox (and possibly other browsers). 2017-03-01 Server costs prepaid for another 12 months! The website, Minecraft server, UT server, SAX, and other Cemetech services are secure for another year. As always, contributions to offset this sizeable personal cost are greatly appreciated (props to PT_ for a generous contribution this year, and to admins like comic, Merth, and Jonimus who have contributed in past years). 2017-05-21 Implemented first review moderation tools: deleting existing reviews, including confirmation and SAX message. 2017-07-03 After over six years of dedicated service as an administrator, and seven as Cemetech staff, Shaun "Merthsoft" McFall has been officially moved to the Emeritus staff category. Unfortunately, real-life time commitments currently prevent him from putting in the time he feels the Administrator position deserves. 2017-07-21 The main Cemetech server, used for a few fun tasks, has been upgraded to a new version of its OS. We expect all the usual improvements, including security and performance improvements. 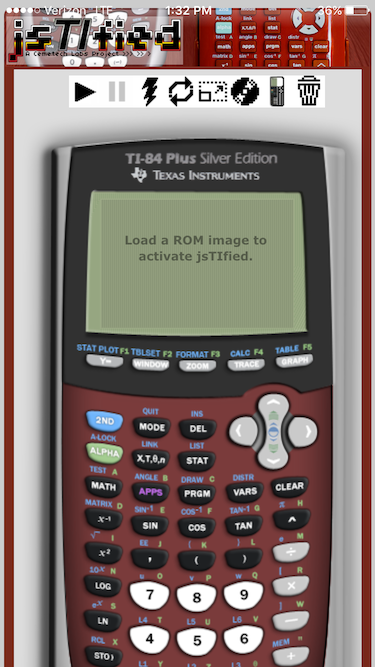 2017-07-22 Upgraded SourceCoder's TI-84 Plus CE C support to C SDK toolchain v7.3, fixed bugs. 2017-07-28 Implemented Notifications API-based highlights for SAX. 2017-07-29 Updated RemovedFromGame image links as per relevant Bitbucket issue. 2017-08-04 Testing unobtrusive ads in the SAX box and at the bottom of the page for logged-out users to measure how much revenue this could produce to offset server costs. 2017-08-05 Added additional information to registration links (profile.php?mode=register&src=[...]) to make it clearer what is driving user registration, especially from forum topic pages (src=posting). 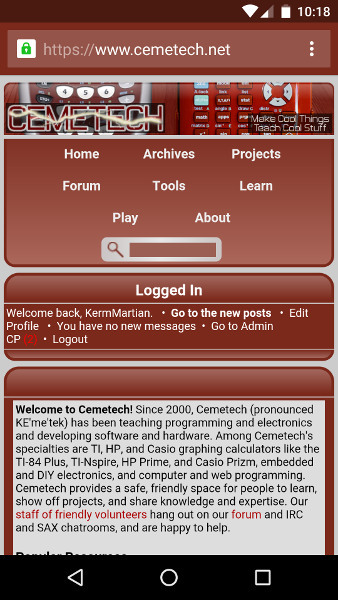 The Cemetech forum is our hub for interacting with the community: asking questions, getting and offering help, finding information, and showing off your work. To start a new topic, scroll down to find the relevant subforum section, click to enter that subforum, and then click "Post New Topic" to start your own topic. 2017-08-05 Review moderation options (Delete/Edit) are now only shown to administrators. These will also eventually be options for reviews' authors. 2017-08-05 Advertisements are now marked by a small "Advertisement" string above the ad. 2017-09-04 I've registered the domain ceme.tech for the next 10 years. This will be used alongside cemete.ch and also for branding purposes. 2017-11-21 Changes to the navigation bar. © Copyright 2000-2019 Cemetech & Christopher Mitchell :: Page Execution Time: 0.158253 seconds.